Macy’s Merchandising Group, New York, N.Y. announced a voluntary recall of Martha Stewart Collection Enamel Cast Iron Casseroles because the enamel coating on the cast iron casseroles can crack or break during use. This can cause the enamel to crack and fly off as a projectile, posing a risk of laceration or burn hazard to the user or bystanders. The recall involves Martha Stewart Collection™ Enamel Cast Iron Casseroles in 7 quart, 5.5 quart and 2.75 quart sizes, with exterior enamel finishes in red, cobalt blue, sand, green, blue, white, mustard, brown and teal, with cream colored interior finishes. 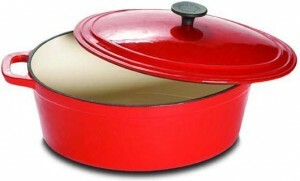 The casseroles are embossed with Martha Stewart Collection™ on the bottom and lid handle. The affected casseroles were sold at Macy’s stores and AAFES, MCX and NEX locations nationwide, and on macys.com between June 2007 and June 2011 for between about $25 and $170. Consumers should immediately stop using the casseroles and return them to any Macy’s store for a full refund. For additional information, contact Macy’s toll-free at (888) 257-5949 between 10 a.m. and 10 p.m. ET or visit the Macy’s. Previous Post: « Chevys Fresh Mex: Special Gifts on Your Birthday! Thank you for this, I bought one for DH for his birthday last year. Thanks for the heads up. I have one and just used it the other evening while making some jam. Looks like a trip to Macys is in order. Thank you for the post! I received one as a wedding gift. Now we have a baby and would not want to chance that happen with her in the area.